Our new research shows that the promotional images used in toy catalogues fall back on the same old tired stereotypes, with only a handful of boys shown with dolls, and girls accounting for just 11% of the children shown with cars or other vehicles. Our research looked at six 2016 Christmas toy catalogues (Smyths toys, Argos, Tesco Toys, The Entertainer, Early Learning Centre and Toys R Us) to see what messages children and other shoppers were being offered about boys’ and girls’ play. As we found in our TV ads research last year, manufacturers’ promotional material shows children’s play in a very stereotypical way. Five of the catalogues included no boys in images of baby dolls and prams. Only 11% of children playing with cars or other vehicles were girls, and those girls were almost always shown with pink versions of toys. Girls were twice as likely to be shown with art, craft and music toys. Boys were more than twice as likely to be shown with construction toys. 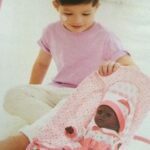 It was particularly disappointing to see no boys at all with dolls in the Toys R Us catalogue – we’d been pleased to see boys with dolls in 2013. While none of the catalogues we looked at used ‘Girls toys’ and ‘Boys toys’ labels, there were still visual cues and groupings which were driven more by gender associations than logic. 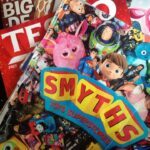 For example, in the Smyths catalogue the sections were not labelled by gender, but ‘Fashion and Dolls’ includes toy kitchens, Lego Friends/Elves and collectibles like Shopkins as well as fashion and baby dolls, all with a pink page tag in the corner. This grouping only makes sense if it really means ‘Girls toys’. This matches Smyths instore layout, with Lego Friends and Elves with fashion dolls. Similarly, the ‘Cars and construction’ section has a blue page corner for navigation, and includes science toys such as chemistry sets and telescopes, weapons like Nerf blasters and ‘spy’ toys as well as vehicles and building sets such as the rest of the Lego. The science toys pages from the Smyths Toys catalogue include a balance of boys and girls. It’s not hard to showcase toys in a balanced way. Interestingly, science toys were often good examples – perhaps because there’s been so much attention given to the importance of encouraging both boys’ and girls’ interest in science. Retailers appear to be ahead of most toy companies on this area. 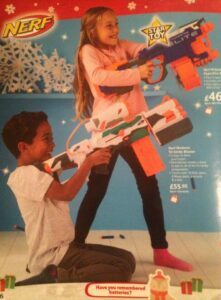 For example, Tesco’s own photography for their catalogue covers shows a boy and a girl together, playing in less stereotyped ways. Early Learning Centre, which primarily sells its own toy lines, and therefore has more control over product photography than other retailers, was the only catalogue to include images of boys playing with baby dolls, and had far more balanced numbers of boys and girls playing with vehicles. Last year French supermarket chain Super U in France set up their own photoshoot to generate less stereotyped images of children for their catalogue – this (subtitled) video showcases what they did. 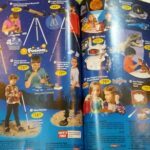 Spanish retailer Toy Planet has blazed a trail for inclusive photos in their catalogue since 2013. Toy retailers are showing it can be done better – it’s time for the toy industry to apply some creativity to how they develop, present and promote toys, and stop pushing the same tired old stereotypes. 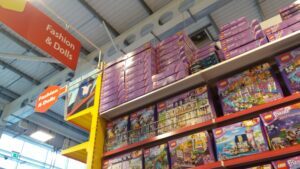 An end to gender grouping of toys either in store or in catalogues – eg Lego Friends and Elves with other lego, dressing up and role play all together. More product photography that shows boys and girls playing together, just like they do in real life, and includes children in a more balanced way – eg by including girls in images of vehicles, and playing with vehicles that aren’t pink. Find out more about which retailers are letting toys be toys this year. This is all very well, but studies show that children do select toys based upon their gender. The “blank slate” theory is not true. Given the cost of advertising don’t you think it might be unfair to expect companies to show girls playing with boys’ toys? Especially as the catalogues are often shown to children to help them pick toys. Also please see the acclaimed book The Female Brain by Dr. Louann Brizendine. Thanks for your comment. Research on toy preference is quite contested (the study you mention, for example included children from 9 months to 3 years, which is a very wide range in terms of their exposure to social cues, and even the youngest children will respond to colours and shapes which are familiar, even before they’re aware of their own gender. Crucially though, no study shows that boys or girls are only interested in one sort of toy, so whether or not you believe there are any natural tendencies, it’s surely better for all children to be offered a free choice. Even the strongest study results show a slight preference, at a population level. Showing five times as many boys with vehicles as girls is out of all proportion. Most children are likely to enjoy a range of play, and it’s best for their development if they do. If the tendencies are natural, there’s no need to reinforce them and in the process make the (significant) minority feel there’s anything odd about them. Dr Brizendine’s book is now 11 years old and possibly doesn’t reflect the latest research in this area. You might like to take a look at Dr Cordelia Fine’s 2017 award-winning book ‘Testosterone Rex’ for another perspective.